An overwhelming retirement service was held on Sunday, 19th August, 2018 for the Aflao Area Head of The Church of Pentecost, Apostle Osei-Wusu Brempong, who has meritoriously served in the full-time ministry of the Church for 33 years. The service, which took place at the Shekinah Temple in Aflao, was officiated by Prophet James Osei Amaniampong, Teshie-Nungua Area Head and Executive Council Member, assisted by Apostle Yaw Adjei-Kwarteng, Hohoe Area Head and Executive Council Member. 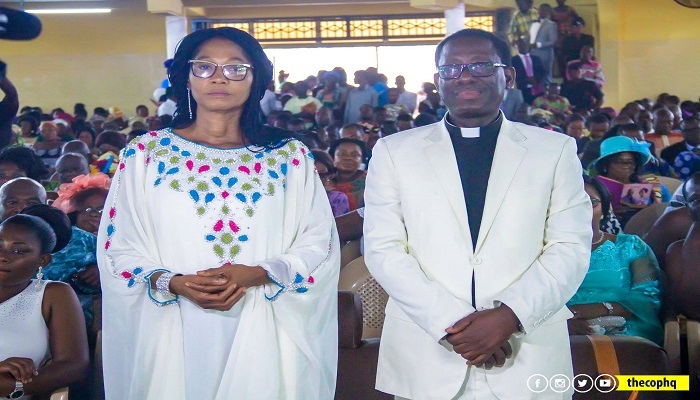 It was attended by over 4000 members and 207 ministers and their wives, including Apostles Ousmane Patinde Zabre (Togo National Head), Isaac Nii Kotei Djani (Tamale Area Head), and Samuel Osei Asante (New Tafo Area Head), all members of the Executive Council. In a sermon titled: “Oh Lord, Remember” based on 2 Kings 20:1-6, Apostle Isaac Kotei Djani said Hezekiah was devoted, committed, faithful and truthful to God, and pleaded with God to remember what he has done for Him. He explained that what Hezekiah told God meant that he had had a single minded devotion to God and had done what was good in God’s eyes. Apostle Kotei Djani entreated Christians to look up to God, depend solely on Him in times of need, strive to please the Lord and stop pleasing men. Citing David and Jonathan as an example, he noted that man always wants to be remembered for good deeds not bad deeds. He admonished the members to prepare for the second coming of Jesus Christ, and also prepare to leave the scene because no condition is permanent. Apostle Kotei Djani cautioned that God is sovereign, and that no one should use their good deeds as yardstick to demand answers from God to their requests. As part of the service, a certificate of honour was presented to the retired Apostle for a good work done. Apostle Osei-Wusu Brempong, a native of Kofiase/Sekyedumase in the Ashanti Region, was born on October 24, 1953 in Kumasi to Opanin Osei Kwabena and Madam Adwoa Antwiwaa, both of blessed memory. He started basic school at SDA Primary School, Kofiase from 1960 to 1966 and continued to L/A Middle School from 1966 to 1970. He then proceeded to Sekondi College from 1970 to 1975 and had his Post-Secondary education at Wesley College, Kumasi, from 1975 to 1978. He had the GCE ‘A’ Level at Workers’ College in Kumasi from 1981 to 1982. He also studied for the BA in Theology and Religious Studies at the University of Botswana, Gaborone, from 2001 to 2004 and obtained the MA in Theology and Religious Studies from the same university in 2005. He was employed as a teacher and taught at Mmofraturo Girls’ Boarding School in Kumasi from 1978 to 1985. He was called into the full-time ministry of The Church of Pentecost in 1985 in Kumasi. He was ordained a pastor in 1990, and as an apostle in 2014. He has served in various positions and stations in the Church, namely Jachie District from 1985-1990, Tamale District from 1990-1996, Tema North District from 1996-1999, Missionary to Botswana from 1999-2005, McCarthy Hill District in Accra from 2005-2010, National Coordinator for the Northern Outreach Ministry (NOM) at the Headquarters from 2010-2014, and finally as Area Head for Aflao from 2014-2018. He was also a part-time lecturer at the Pentecost University College (PUC) in 2008. He is married to Comfort Akua Afriyie Boateng (now Mrs. Comfort Osei-Wusu Brempong). Their union has been blessed with five children.